Ideas come from plenty of different avenues of inspiration. Some are fantastic and worth pursuing, while others are a little less actionable. 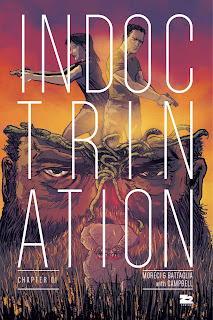 Some ideas bring with them the risk of being killed and Indoctrination from Michael Moreci and Matt Battaglia is asking how to do just that. Across the dusty plains of America’s southwest, a deadly storm is brewing. A string of murders portend the sinister designs of an infamous terrorist to bring about the end times. Two FBI agents have heeded the signs, and only their rogue actions—aided by a potentially untrustworthy expatriate with deep ties to the terrorist—can push this darkness back. It's a comic book series about America’s terrifying underbelly—of death cults and sleeper cells, serial killers and apocalyptic nightmares. Indoctrination follows these two FBI agents as they develop a complicated relationship with an infamous terrorist, in an attempt to solve a string of grizzly, seemingly related murders. Mixing elements of True Detective with Seven, this new series from Z2 Comics captures the definition of fear in the 21st century. 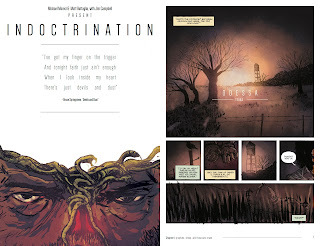 Indoctrination is due out in June from Z2 Comics and will retail for $3.99. Full press release below. Across the dusty plains of America’s southwest, a deadly storm is brewing. A string of murders portend the sinister designs of an infamous terrorist to bring about the end times. Two FBI agents have heeded the signs, and only their rogue actions—aided by a potentially untrustworthy expatriate with deep ties to the terrorist—can push this darkness back. 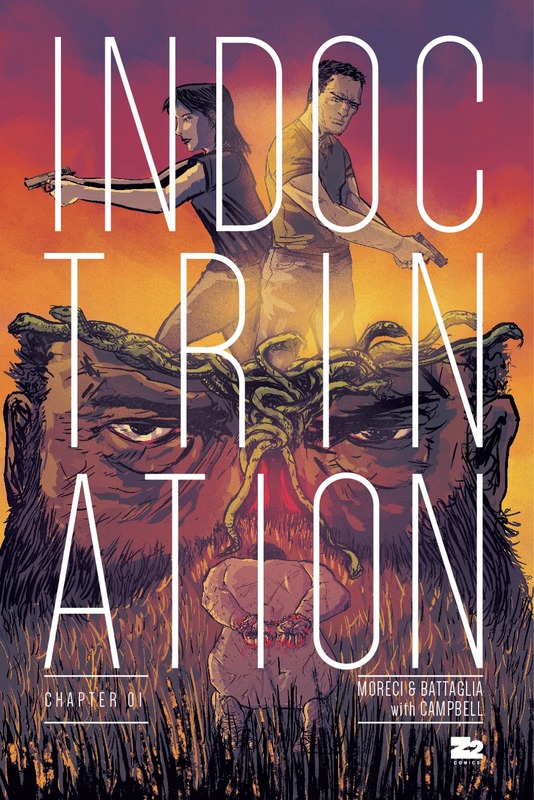 This June, comic book writer and novelist Michael Moreci (Roche Limit, Burning Fields) and artist and former political operative Matt Battaglia will unleash INDOCTRINATION, a comic book series about America’s terrifying underbelly—of death cults and sleeper cells, serial killers and apocalyptic nightmares. INDOCTRINATION follows these two FBI agents as they develop a complicated relationship with an infamous terrorist, in an attempt to solve a string of grizzly, seemingly related murders. 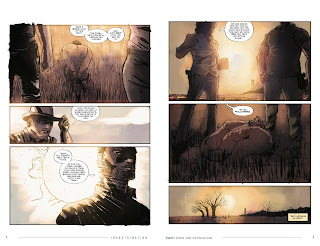 Mixing elements of True Detective with Seven, this new series from Z2 Comics captures the definition of fear in the 21st century. At its core, INDOCTRINATION is an exploration of the power of ideas, and how ideology can drive mankind to act in horrifying ways. The series marks the first full length illustrated comics work of Battaglia who has previously worked for a Washington DC Super PAC. 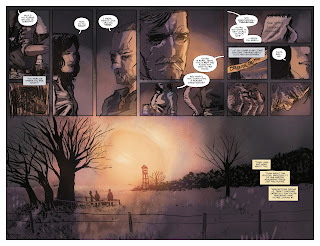 Michael Moreci’s original comics works include Roche Limit (Image Comics), which is currently in development for television, and Burning Fields (BOOM! Studios). Moreci’s Curse (BOOM! Studios), a modern-day werewolf story, is in film development with Blumhouse Productions. His self-published series, ReincarNATE, has been optioned for television by Patrice Théroux and Buck Productions. Moreci has also written the in-canon comic series that bridges the gap between Rise of the Planet of the Apes and Dawn of the Planet of the Apes. Also a novelist, Moreci recently signed a two-book publishing deal with St. Martin’s Press to write a space adventure series inspired by Star Wars. He is also currently writing the novel Spy Swap for Lawrence Gordon Productions, to be published by Thomas Dunne Books. Moreci lives in Chicago with his wife, two children, and his dog. Matt Battaglia is an illustrator and graphic designer, Indoctrination marks his first full length illustrated comics work. Prior to Indoctrination he colored the BOOM! 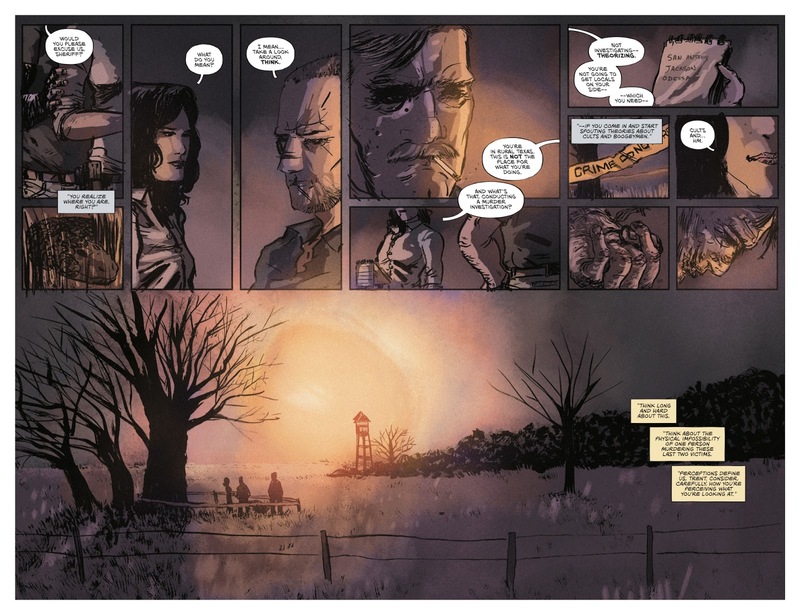 title 'Dead Letters' and colors the Image Comics series 'Roche Limit' written by Michael Moreci. Outside of comics Matt is a graphic designer, he currently works at Hirepurpose. Previously Matt worked in DC during the last election cycle, where he worked for a C4 and a Super PAC.